It dawned on me the other day, that this is our last summer with a preschooler in the house. I'm not generally a mushy sentimental type, and so far I've enjoyed the children at all their various ages. It wasn't a sad thought - just a sudden realization, that we have a number of Nick Jr/Playhouse Disney/Veggie Tale DVDs, and if we're going to get any more use out them, or do any of their accompanying activities, it better be now. Activities like making Max's Bug Salad, from Party Time With Max & Ruby. In the episode, actually entitled "Max's Bug Salad", the young bunny, sibling pair are helping their grandmother prepare for a tea party with her friends. Grandma makes scones, with a secret ingredient, and Ruby makes the gelatin salad, while Max brings in flowers, and a ladybug from the garden. Ruby shoos her brother, and the bug out of the house several times, and wishes for a special ingredient to add to her gelatin salad, to make it as special as Grandma's scones. Grandma suggests Max pick some strawberries to add to the gelatin. He brings in the berries, with the bug, and in the end adds his own special ingredient (gummy bugs) to the salad, making it a big hit at the party. The children have become expert ladybug spotters in our own garden. And, even though it's too early for gathering strawberries there yet, we decided there was no time like the present for making our own bug salad. They complained a little when I produced red Jell-O (Ruby's was green). And for our "special ingredient", we added a packet of strawberry Gushers - the closest thing I could find to gummy bugs at the store. It wasn't exact, but that didn't matter, because it wasn't really about the bugs, or the Jell-O. It was about the beginning of saying good-bye to characters we have grown to love as a family, but are ready to outgrow. And, it was delicious. Does this mean I have to stop reading Max and Ruby, too? It is always so bittersweet to watch our children grow up. I keep looking at Selena and can't help but ask when did this happen? Making up that delicious red "salad" sounds like a great way to farewell some much loved characters. 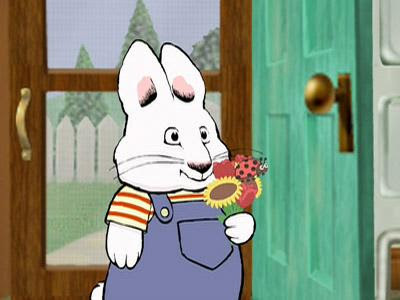 Awwwwwwwwwwwwwwwwwwwwwwwwwww, R loves Max and Ruby. I'm not ready to say goodbye to it yet. I do often wonder where their parents are and I feel bad that Ruby is always in charge of her brother. Yes, I realize that it is just a cartoon, but I am weird like that. My kids just discovered Max and Ruby, and it rather cracks me up that all 3 of them LOVE it. We haven't seen that one yet. Have you checked out the lost Lady Bug project (http://www.lostladybug.org/)? You send in photos of the ladybugs in your yard and identify the species. There is a kids section of the website, too. It seems that invasive species are pushing out the native ones. And you can count the spots to tell what kind is in your area. 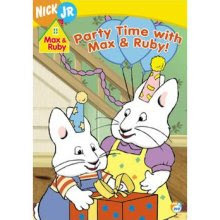 We love Max and Ruby books but never watched cartoons. The "salad" looks pretty neat.